It can take advantage of a vulnerable web application. By using this software, user can perform back-end database fingerprinting, retrieve DBMS login names and password hashes, dump tables and columns, fetch data from the database, execute SQL statements against the server, and even access the underlying file system and execute operating system shell commands. The distinctive power of Havij that differentiates it from similar tools lies in its unique methods of injection. The success rate of attack on vulnerable targets using Havij is above 95%. New bypass method for MySQL using parenthesis. 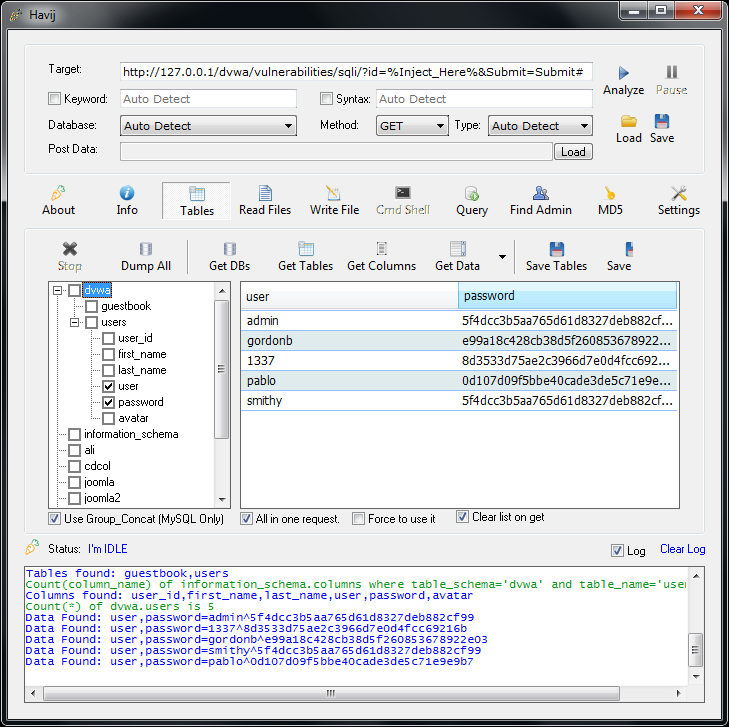 Write file feature added for MSSQL and MySQL. Saving data in CSV format. Advanced evasion tab in the settings. 'Non-existent injection value' can now be changed by user (the default value is 999999.9). 'Comment mark' can be changed by user (the default value is --). Bugfix: adding manual database in tables tree view. Bugfix: finding string columns in PostgreSQL.